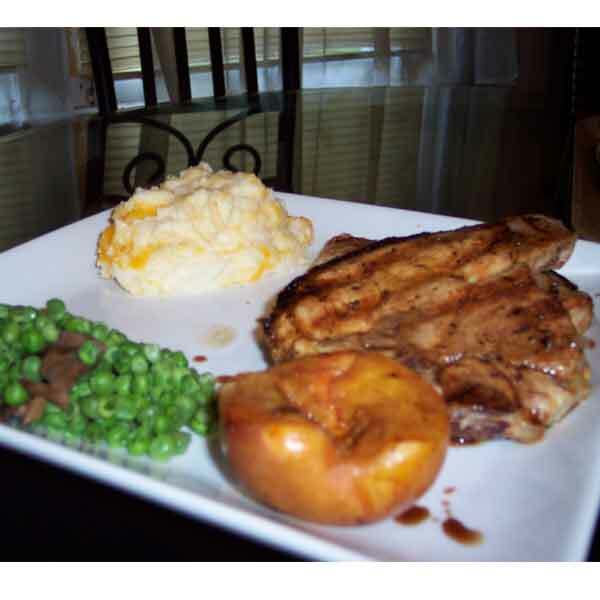 I had the neighbors over for dinner last night and wanted to throw a few twists at em so I grilled these chops, grilled a few balsamic glazed peaches, made some faux potatoes and sweet peas with baby portobello mushrooms and it really turned out pretty impressive. I also made an awesome sugar free dessert but I’ll save that for another post. The really cool thing was that my neighbors daughter ate the “potatoes” and said they were the best she had ever had. I just didn’t have the heart to tell her that it was cauliflower I think it would have just crushed her dreams of not eating veggies haha. This recipe works perfect for about six chops, if you need more just make more! Take the chops and season with garlic salt and lemon pepper to taste, make sure to season both sides and place in the fridge for a few minutes while you get the glaze ready. If you like a little heat (which I do) you can mince up 1 roasted jalapeno to add to the mixture. This is easy, just combine the Balsamic Vinegar, the syrup from the can of peaches, two peach slices, and all of the other ingredients in a bowl. Mash the peaches in as you are mixing all ingredients. You don’t even have to cook this, it’s ready to glaze as is. Now that wasn’t so tough was it? Oh yeah, set a little bit of this glaze aside because you are going to want to use it after everything is cooked. Place the chops on a hot grill for about 3 minutes on one side. About a minute before flipping them brush the glaze over the chops and let them sit for another minute on the grill. The goal here is to get everything nicely coated and only flip the chops once to get nice grill marks. Now, flip the chops over and immediately brush the new side with the glaze. Notice we didn’t brush this side before putting them on the grill? Well, there is some sugar in the syrup that we used to make the glaze and we don’t want that sugar to burn as the chops grill. So, now that they are flipped let them cook for another 3-4 minutes. Turn the chops over as you remove them from the grill, this will have the freshly cooked side up, add just a little more glaze to the chops just to make em sparkle. Oh, God, no I didn’t say sparkle, stupid Twilight!!! Anyhow, go ahead and plate up the chops, now that they are on the plate, use the glaze that you set aside to drizzle over the chops for a perfect presentation. This a pretty simple and quick fix to add to any side that you want to do. Keep posted and I will put up some info on the faux potatoes, sweet peas, dessert, and grilled peaches pretty soon. I hope you enjoy, remember, be safe and get out of the house and grill somethin! Amazingly awesome. I totally expect samples next time you cook up this masterpiece…especially of the faux-potatoes. Super Post, what do your reader think about jamie oliver? There are some really good jamie oliver inspited recipes mydish. I have also sent this post to my myspaceprofile.